A sociological understanding of social problems. Social Problems: A Down to Earth Approach, 11/e is a theoretically balanced text that provides the latest research and a consistent structure to help students analyze critical social problems facing the United States. The author presents both sides of an argument with a neutral voice and uses a "down-to-earth" writing style. 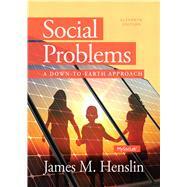 By using this text, not only do students gain a sociological understanding of social problems, but also they are able to explore and evaluate their own opinions about specific social problems. They will gain a greater awareness of the social forces that shape their orientations to social problems and their perspectives on social life. The ideas in this book penetrate students’ thinking and help give shape to their views of the world. MySocLab for Social Problems features an engaging student experience including an interactive eText, the New Core Concepts Video Series, the New Social Explorer. Personalize Learning – MySocLab is an online homework, tutorial, and assessment program. It helps students prepare for class and instructor gauge individual and class performance. Improve Critical Thinking – Thinking Critically About the Chapter – At the end of each chapter are several questions designed to help students evaluate what they have read. These questions also lend themselves well for stimulating class discussions. Engage Students –Opening Vignette – Intended to arouse student interest in the social problem and to stimulate the desire to read more, this brief opening story presents essential elements of the social problem. Explore Theory – The three basic theories – Symbolic interaction theory, functional theory, and conflict theory— are introduced early in the text; giving students the opportunity t immediately grasp the differences of these theories. Support Instructors – MySocLab, Instructor’s eText, Instructor’s Manual, Test Item File, Electronic “MyTest” Test Bank, PowerPoint Presentation Slides, and Pearson Custom course material are available. Note: MySocLab does not come automatically packaged with this text. To purchase MySocLab, please visit: www.mysoclab.com or you can purchase a ValuePack of the text + NEW MySocLab (at no additional cost): ValuePack ISBN-10: 0205965121 / ValuePack ISBN-13: 9780205965120. James M. Henslin, who was born in Minnesota, graduated from high school and junior college in California and from college in Indiana. Awarded scholarships, he earned his Master’s and doctorate degrees in sociology at Washington University in St. Louis, Missouri. After this, he was awarded a postdoctoral fellowship from the National Institute of Mental Health, and spent a year studying how people adjust to the suicide of a family member. His primary interests in sociology are the sociology of everyday life, deviance, and international relations. Among his numerous books are Sociology: A-Down-to-Earth Approach (Allyn & Bacon, available in three versions); Social Problems (Allyn & Bacon); and Down-to-Earth Sociology: Introductory Readings (Free Press). He has also published widely in sociology journals, including Social Problems and American Journal of Sociology.